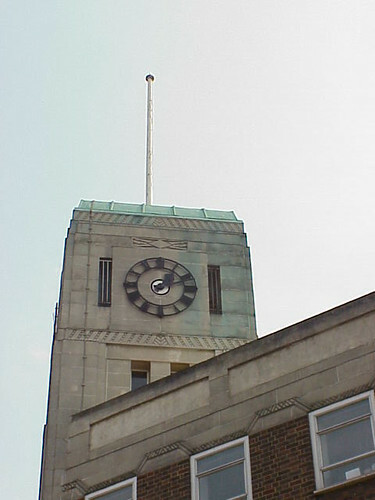 I snapped this Art Deco office building in Twickenham in 2003 when this fabulous clock tower attracted my attention. I know nothing about the building but from the decoration I suspect it was associated with a local Electric Board or and Electrical Showroom. 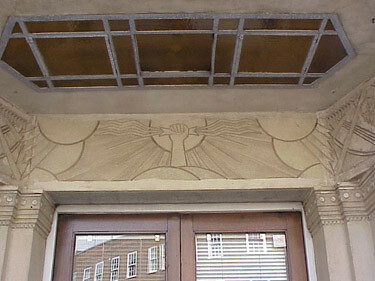 A relief above the door shows a disembodied hand perhaps generating or conducting electrical waves to transmission lines. 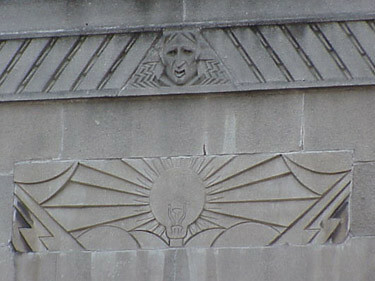 Other reliefs on the building are less ambiguous clearly showing a lit electric light globe. 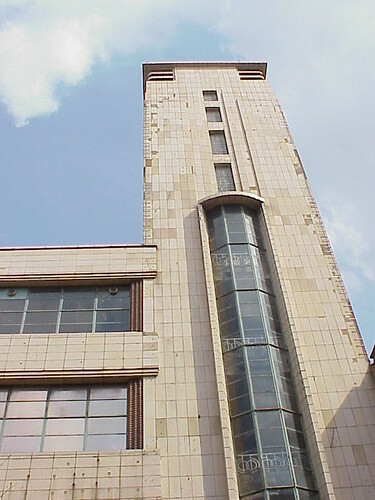 This is the former Co-Op department store in Woolwich. I took these photos in 2003 so I can only imagine that the building has deteriorated further since then. I see on the We Love Woolwich that the building is earmarked for demolition by Greenwich Council to make way for the Woolwich Triangle re-development. I hate to see a building like this demolished when it could become a landmark feature of the redevelopment and provide a tanigible link to the past use of the site. Please sign the online petition to Save the Woolwich Co-Op building and hopefully we will see this beautiful building occupied and operational again. 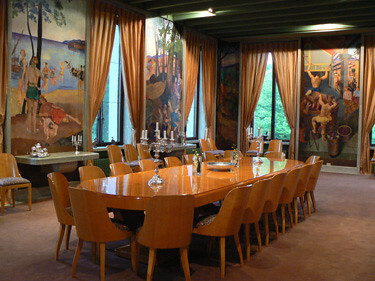 This is the so-called Birch Room at the French Embassy in Ottawa. 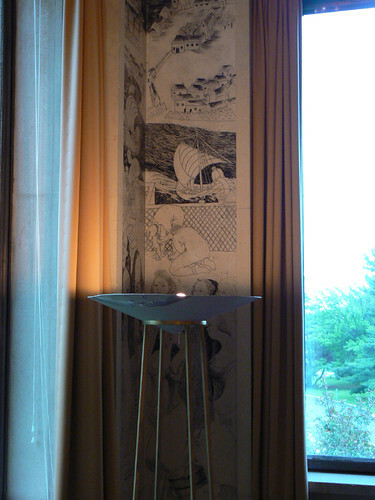 I say so-called because officially this is Le Fumoir or the Smoking Room. 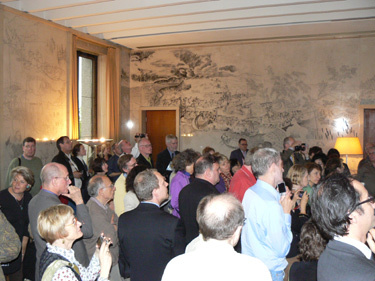 The astounding thing about this room is that Eugene Beaudouin had the walls and ceiling covered with white birch bark giving the room an alternate name and creating the effect shown below. 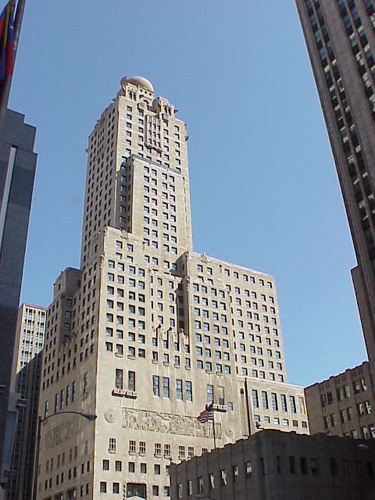 The Chicago Intercontinental Hotel at 505 North Michigan Avenue was built in 1929 but back then it was the Medinah Athletic Club, designed by Walter W Ahlschlager for the Shrine Organisation. It became a hotel towards the end of WWII when in the mid 1930s the Shrine Organisation were not been able to keep the building due to the affects of the 1929 Stock Market crash and it was used for various purposes during the intervening years. 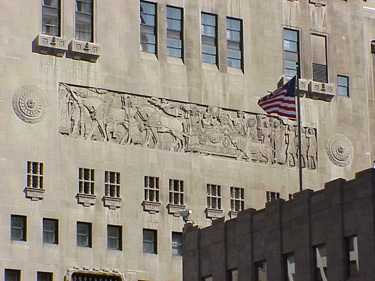 The external decoration includes this Assyrian inspired frieze and a group of three warriors several floors above it. 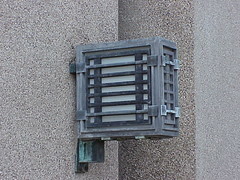 Frank Lloyd Wright designed Westhope in 1929 for his cousin Richard Lloyd Jones. The house is constructed from concrete blocks but unlike some of Wright's concrete block houses in Los Angeles, Westhope has large expanses of glass and has a very bright and airy feeling inside. 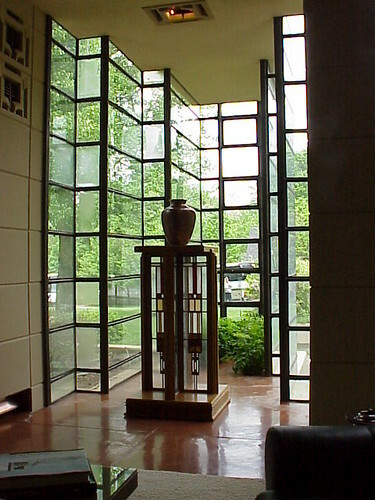 In particular I love the stepped glass nook that Wright has created in the windows shown from outside in the photo at the top of this post and then from inside in the final picture. 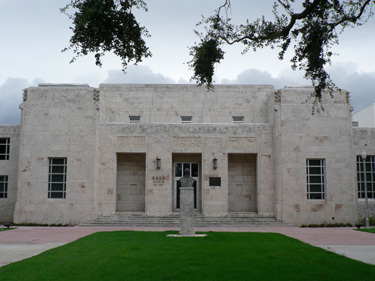 The Bass Museum of Art in Miami South Beach started life as the Miami Beach Public Library and Art Center in 1930. 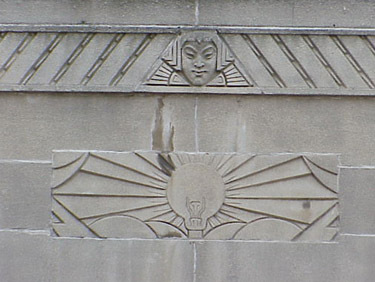 The building was designed by Russell Pancoast who was a grandson of Miami Beach pioneer John A Collins. 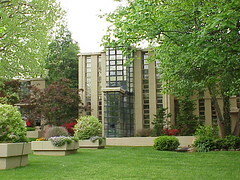 In the 1960s the City of Miami Beach accepted the at collection of John and Johanna Bass and the Bass Museum of Art was established. 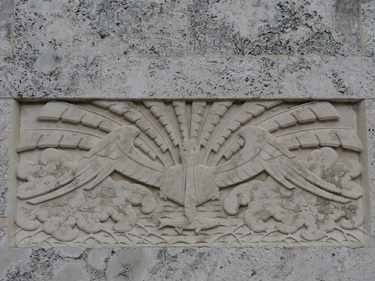 The building includes decoration featuring seabirds such as this panel with a pelican and a series of 3 seagulls at each corner. 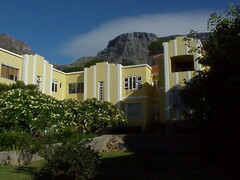 This absolutely fabulous Art Deco block of flats is Glen Alpine in the Cape Suburb of Vredehoek. 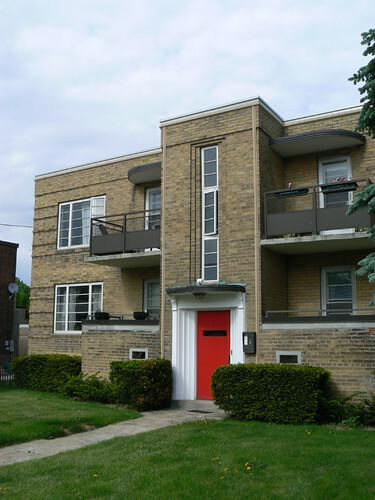 Dating from 1939, Glen Alpine was designed by architect Dawood Jacobs. 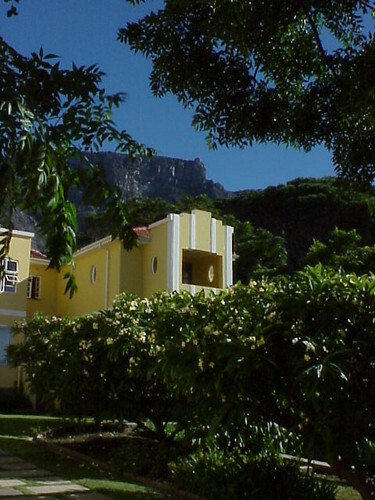 The location is spectacular, in the foothills of Table Mountain overlooking downtown Cape Town. 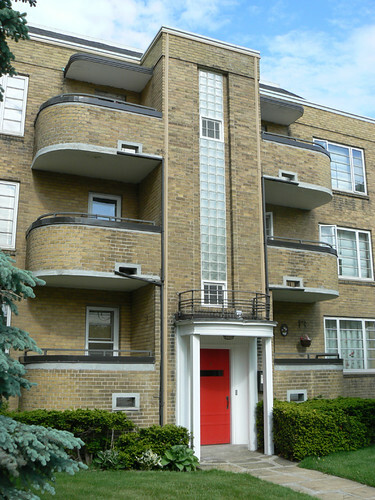 Tim Morawetz in his excellent book Art Deco Architecture in Toronto describes the Garden Court apartments as "arguably Canada's finest example of low-rise, multi-unit housing built in the Streamlined Moderne style". 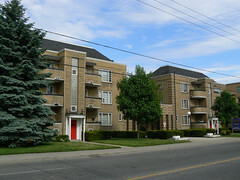 The complex consists of two and three storey blocks surrounding a central courtyard. 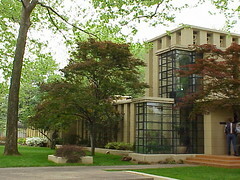 The buildings were designed by Page and Steele and the landscaping was developed by H B Dunnington-Grubb. George Coles designed this fabulous Egyptian Temple which was constructed in North London in 1930. 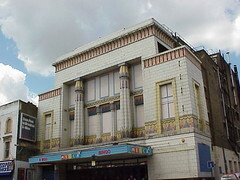 It is the Grade II Listed former Carlton Cinema in Islington. In recent years it has been a bingo hall but was closed in March 2007. 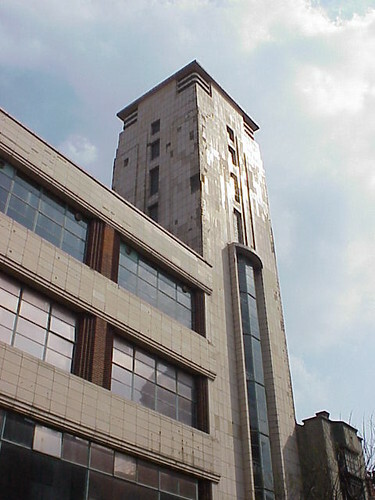 In May 2007, the Islington Gazette reported that the interior had been trashed by hundreds of ravers who partied "like wild animals" during a 24-hour bender of drink, dance music and destruction. 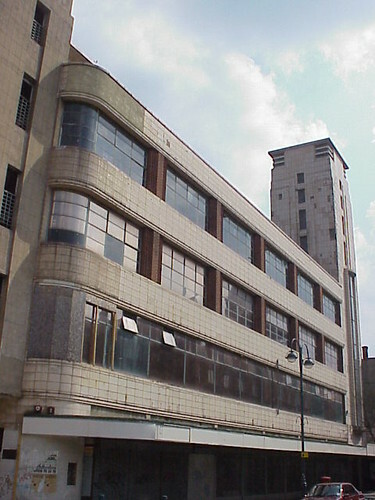 Last month, theIslington Gazette again reported on the fate of the former Carlton cinema. Newly-founded evangelical church Resurrection Manifestations wants to restore the 2,300-capacity building as a conference centre, cinema and community venue. The church bought the building in 2007 and will build a contemporary seven-storey block of 44 flats at the back of the site to help pay for the work. Representatives of the church are quoted as wanting to return the building to its former glory. This looks like a great compromise and plans for the redevelopment are due before Islington Council in December 2009. 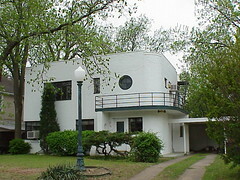 A modernist house in Tulsa with a simple metal balcony curving around the rounded corner of the house. The house also has a porthole window and there is also a flight of stairs leading to what is probably a flat roof. 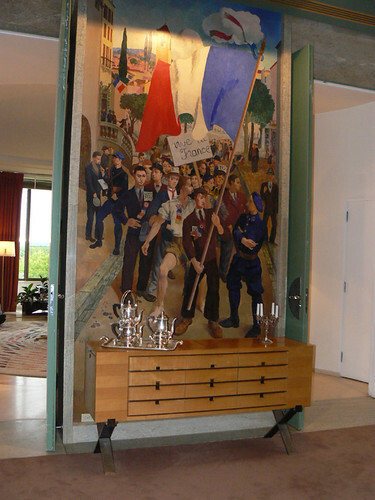 I thought today I would show you another room from the French Embassy in Ottawa. 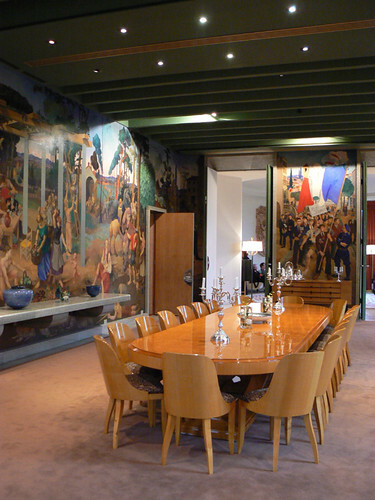 This is the dining room with its fresco painted walls by Alfred Courmes. 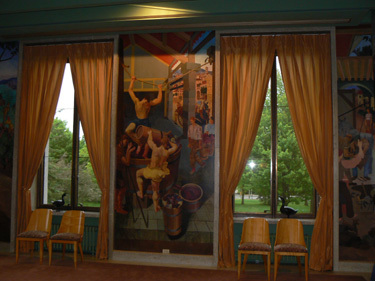 The painting was completed between 1937-39 when the embassy was under construction. When I was in Ottawa earlier this year I was lucky enough to visit the French Embassy. 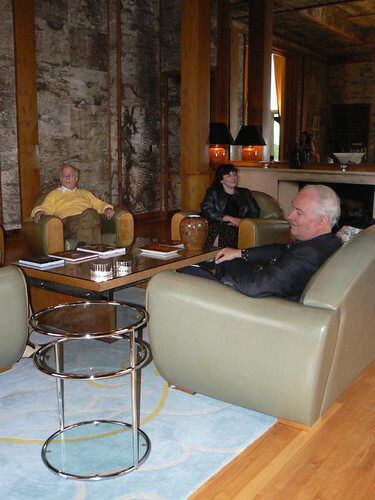 This is the Ambassador's Office which I visited with a few of closest friends. 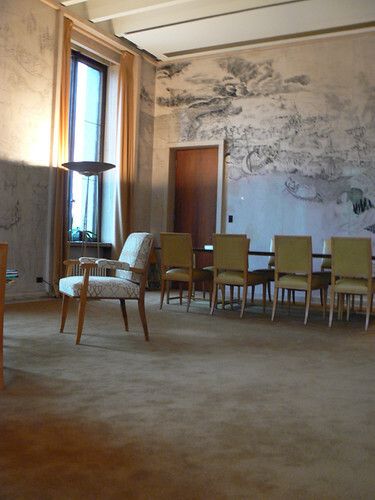 The embassy was constructed between 1936 and 1939 and this room is just one of several spectacular rooms in the building. 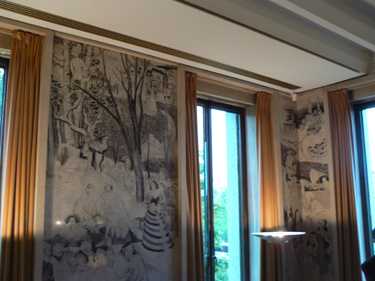 In the Ambassador's Office, the walls have been decorated by artist Charles Pinson using a technique where he engraved the images on the bare walls and then used Indian Ink to bring out the details. Each wall tells a different aspect of the story of the New France settlement in Canada from 1534-1760. 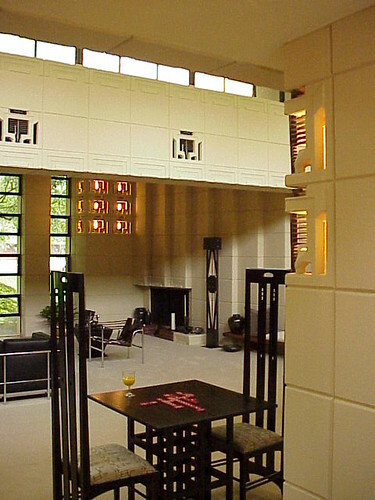 The room features this fabulous fireplace with an asymetrical design with the form of a female bust at one end and two circular columns at the other. 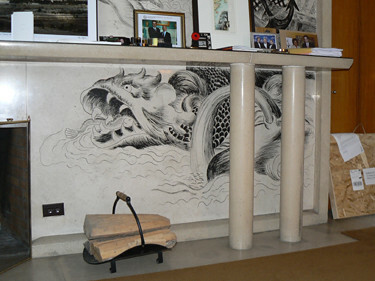 The quality of Pinson's engraving can be seen in this wonderful sea monster breathing fire under the mantlepiece. 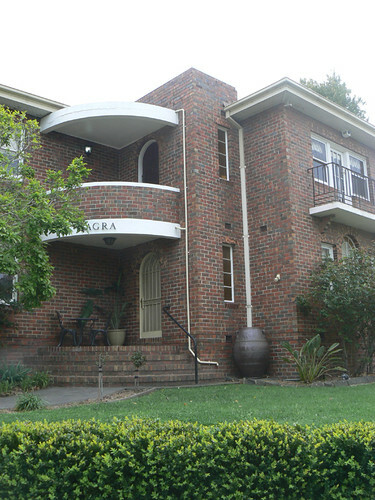 This is an interesting residence called Agra on the Golf Links Estate in Camberwell. I especially like the quarter-circle balcony and the stepped brick supports and simple metal ballustrade on the other small balcony. 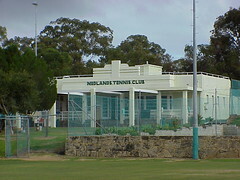 Nedlands Tennis Club was formed in 1925 with their current clubhouse dating from 1938. 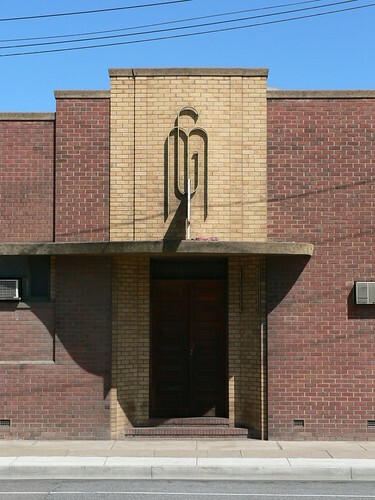 The Assessment Document for the Heritage Council of Western Australia Register of Heritage Places lists Adelaide-born architect Harold Krantz as the designer of this fine interwar sports pavillion. 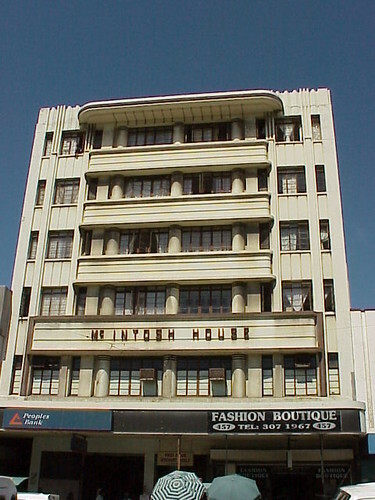 McIntosh House in Durban was designed by Geoffrey Le Sueur in 1936. 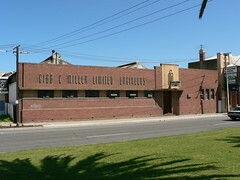 This squat horizontal building is Gibb & Miller Ltd Engineers in Port Adelaide. I can't imagine that the narrow band of windows along the front of the building let in much, if any, light but no doubt there would be windows in the roof to provide light. The perfectly proportioned lettering spelling out the company name adds to the simplicity of the facade but my favourite is the metal "GM" monogram above the entrance. 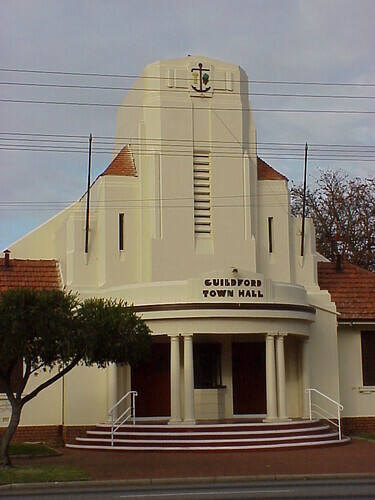 The former Guildford Town Hall is a fabulous Art Deco building dating from 1938. 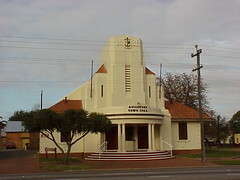 Now included as part of the City of Swan it is no longer required as a Town Hall but it has been retained for functions and other events. 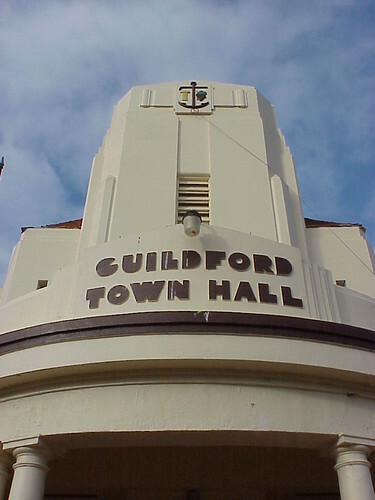 The Guildford Town Hall is charactised by the lack of decoration with the only elements being the name in stylised Art Deco lettering on the semi-circular portico and the coats of arms featuring a large anchor at the top of the tower. 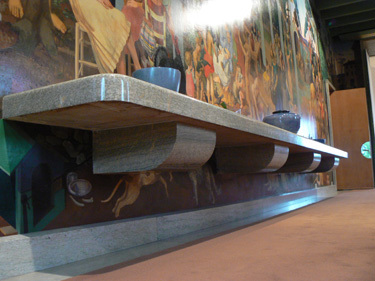 A recent post at the designslinger blog alerted me to the fact that Unity Temple in Oak Park turned 100 years old in September. 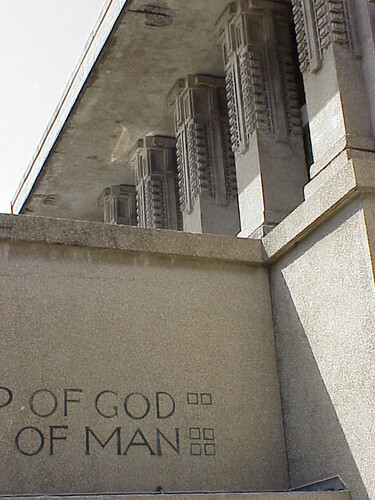 It givs me an excuse to dust off my old photos of Unity Temple (from 2001) and show them here. 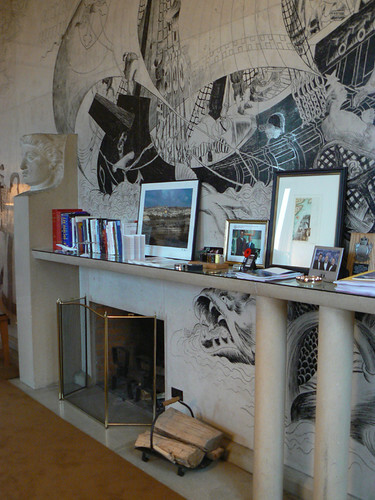 I am pleased to see that there is a certain overlap between the photos at designslinger and the ones I shot however I am sorry I missed the angle that opens their blog post. For me it sums one of the best aspects of Frank Lloyd Wright buildings, the interplay and levels of the various rooflines he works into his designs. Pop over and have a look at their photo, it is a beauty. Now back to my photos. 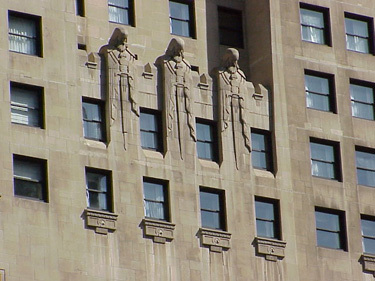 These exterior shots show how Wright was using concrete to incorporate decoration onto his buildings. 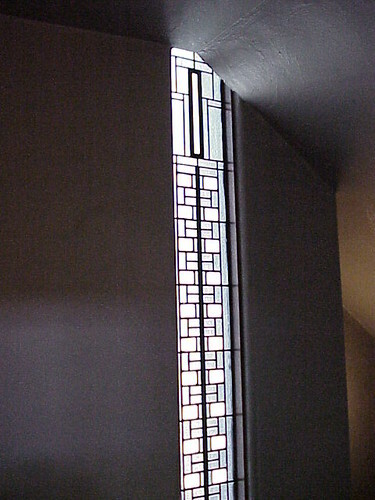 This arrangement reminds me a lot of Hollyhock House in Los Angeles which Wright designed for Aline Barnsdale in 1921. 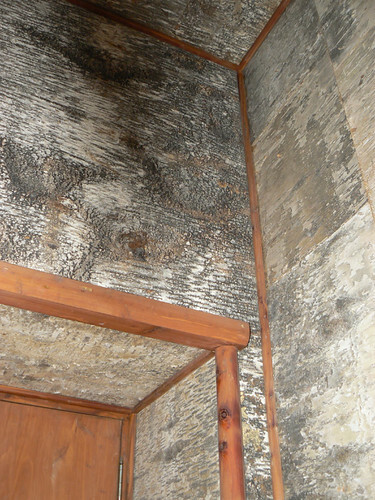 The photos also show one of the main problems with early concrete buildings with damage clearly visible in each of the two main pictures. 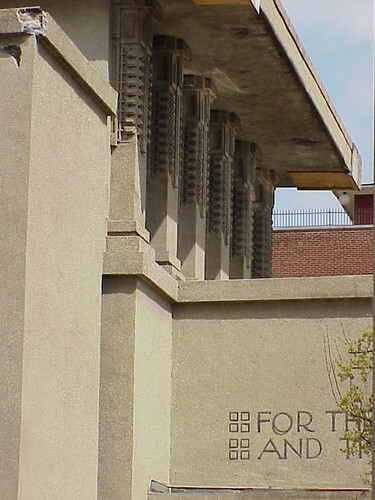 The Unity Temple Restoration Fund are working to maintain and restore the building. 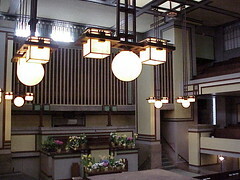 The interior of Unity Temple is one of those views in modern architecture which everyone should see. So detailed and warm compared to the exterior. 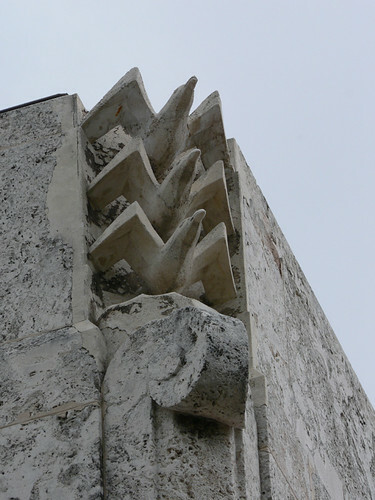 Yet the decoration is still made up of very simple geometric shapes. 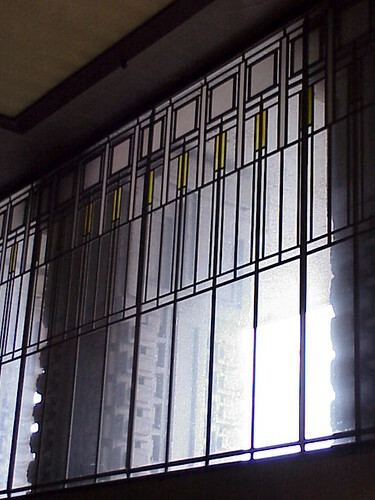 Of course, being a FLLW building, there is lots of stained glass windows as well.